While all the Oconee County candidates in competitive contests in the July 20 Republican primary have declared not just that they are Republicans but that they are Conservative Republicans, an analysis of voting files for 2004, 2006 and 2008 shows several have flirted with the Democratic party, some as recently as in February of 2008. Tammy Gilland, seeking the Post 3 position on the Board of Commissioners, voted in the Democratic presidential primary in February of 2008, in the Democrat primary and primary runoff in 2006, and in the Democratic presidential primary in March of 2004. In sum, Gilland voted as a Democrat as often as she voted as a Republican in the last three elections. Mack Guest, the incumbent Post 2 member of the Oconee County Board of Education, also voted in the Democratic presidential primary in both 2008 and 2004, but he voted in the Republican primaries at the state and local levels. Hank Huckaby, seeking to represent the county in the Georgia House of Representatives, voted in the Democratic presidential primary in 2004, but he has voted as a Republican in six primaries since, including in the 2008 presidential primary. At the June 17 candidate forum, sponsored by the Oconee County Republican Party and by the Oconee Regional Republican Women, moderator Blake Giles, with Oconee County Republican Party Chairman Jay Hanley at his side, asked each candidate to declare if she or he was a Conservative Republican. Giles also asked Guest and challenger Mark Thomas how they would vote in the state school superintendent race and Huckaby, Tommy Malcom and Kirk Shook how they plan to vote in the governor’s race. Malcom and Shook also are running for the 113th House seat. And he asked incumbent BOC Commissioner Margaret Hale and Gilland if they were members of the Oconee County Republican Party and of the Oconee Regional Republican Women. Hanley certainly had the ability to know in advance how the two candidates were going to answer at least the Republican Party part of the question. Individuals can join the Republican Party by simply filling out a form and paying a $20 annual membership fee. Being a member is completely voluntary and has no impact on voting choice, or, as Hale’s answer indicated, on being a candidate. Gilland said she was a “new member” of both groups. Hale has voted as a Republican in seven of the eight primaries or primary runoffs in 2004, 2006 and 2008. She did not vote in the August primary runoff in 2006. None of the candidates has a perfect voting record. Guest, Huckaby and Malcom did the best, missing only two of the 14 elections in the three years. Public records show who voted–but not how they voted–as a necessary step in preventing voter fraud. In Georgia, where voters do not register by party and publicly ask for either the Republican or the Democrat ballot before voting, that information also is public, again to provide a mechanism to check against fraud. Candidates can request a list of registered voters, as can individual citizens. That record indicates the name, address, and registration number for each voter as well as the ballot the voter selected in the most recent primary. The Georgia Secretary of State also has available on the official web site the historical records of voting by year, though these records contain only the county of each voter, his or her registration number, and the elections in which that voter participated during the year. The record also indicates which ballot was selected by the voter in the primaries that year. I purchased, with my own funds, the Oconee County voter list in the autumn of 2008 for a graduate class I teach each year at the University of Georgia. As part of that class, I downloaded the voting history files to show students how to use the available records to validate samples drawn for public opinion surveys. I did not have access to these same files from Oglethorpe County, so I could not check on the voting history of Shook, who lives there. I have summarized the records for the other candidates for the 113th House seat as well as for Kim Argo, incumbent Post 3 BOE member who is unopposed on the July 20 Republican primary ballot, and for John Daniell, incumbent Post 2 commissioner, who also is unopposed in the Republican primary. These are viewable in this table stored on Box.net. Daniell selected the Republican ballot in six of the primaries in 2004, 2006 and 2008. No vote is recorded for him for the 2008 presidential primary or for the 2006 August runoff. Argo voted in the 2008 Democratic primary, but she has voted in six Republican primaries and missed a runoff in the three years for which I examined the records. Daniell and Argo did not participate in the June 17 GOP forum, since neither has opposition in the primary. At that forum, moderator Giles asked Gilland and Hall if they would support making the BOC election nonpartisan. Both said they would not. “You need to know exactly who you are electing. What Party we represent,” Gilland said. “The system that we have now works very well,” Hale said. Giles did not ask this of the House candidates, who would be the ones who would need to introduce any such change to the Georgia legislature, which would have to approve before the change could go into effect. At the beginning of the forum, Giles said the questions he was asking had been submitted to him by the audience and he was adding some of his own. He didn't indicate which were which. The Republic Party might find it easier to enforce a conservative orthodoxy if the county had more people who identified as Democrats and a stronger Democratic Party. Candidates who were not so conservative might be willing to run as a Democrat if they had a chance of being elected. With the Republicans being so dominant in the county at present, however, Democrats are probably the ones who would gain from nonpartisan elections. Which is why the question was relevant at the GOP forum. Oconee County Board of Commissioners candidates Tammy Gilland and Margaret Hale used the GOP Candidate Forum last week to showcase differences on approaches to regional development and similarities on views about the county courthouse and last summer’s redrawing of the county’s organizational chart. Gilland once again said she favored cooperation between Oconee County and Athens-Clarke County on development. Hale said the two counties already are working closely enough together and that the proposed regional plan is not good for Oconee County. Gilland said she has come to the conclusion that the reorganization ordinance passed by the commissioners last August has worked. Hale, who was a proponent of those changes, said the same. Hale said she doesn’t feel that there is any need at this time to move the courthouse. Neither Hale nor Gilland said a move to a county manager form of government is needed. “The regional economic development plan that was presented to the board for consideration,” Hale said, “talked about taking our economic office out of the county, merging it with Clarke County.” She said such a move ignored differences between the economic development offices of the two counties. Local blogger Johnathan McGinty, who also writes a column for the Athens Banner-Herald, stirred the pot last week regarding the regional economic development proposal for Athens-Clarke and Oconee County. McGinty, a proponent of the proposed regional development plan, in a June 18 posting on his blog Beyond the Trestle quoted Gilland as saying in an email to him that the argument that Oconee County would lose its economic development office is “a fear tactic” that isn't rooted in the reality of the existing proposals. McGinty quoted Gilland as saying that she had spoken with several members from both the Athens-Clarke County Chamber of Commerce and the Oconee County Chamber of Commerce and that the location of the joint regional development office is negotiable. “The merger of these bodies is an essential step to drive efficiencies, unify marketing efforts, re-engage at the state level, maximize individual skills, and provide a ‘one stop shop’ for state leaders and others interested in the region,” the report said. The GOP forum was the third such face-off of the candidates, and Gilland and Hale seem to have grown more comfortable sharing the podium and the questions. In response to questions, Gilland presented herself as more cosmopolitan. Hale presented herself as more folksy. They shared a few personal stories, and they dealt with one issue explicitly that involved family. Each woman has a son and a daughter, though Hale’s children are grown while Gilland’s are still in school. Hale’s daughter works for the Sheriff, and Hale answered by saying that the sheriff is an elected official who is answerable to the public, not to the Board of Commissioners. “He is in charge of the sheriff’s department,” she said. The full video of the GOP candidate forum is on the Oconee County Observations Channel of Vimeo. Oconee Enterprise Editor Blake Giles–with Oconee County Republican Party Chairman Jay Hanley at his side–was very direct in his first question to each of the seven Republican candidates. “Are you a Conservative Republican,” Giles asked, with considerable emphasis on the modifier of Republican. “Why or why not?” he continued. “And how will your degree of conservatism affect your decision making” in the job being sought? Giles, who made it clear from the outset that he was acting in his capacity as a Republican and not in any role of a neutral journalist, warned that this was a question “We’re asking all of the candidates” at the Thursday night event sponsored by the Oconee County Republican Party and by the Oconee Regional Republican Women. Incumbent Post 3 Board of Commissioners Candidate Margaret Hale was the first to field Giles’ question, and she answered that she had worked hard to “streamline” government in the county, cutback on the number of county employees and decrease taxes in her time on the commission. Challenger Tammy Gilland said “I do have conservative values” and that she feels it is important to limit and control government. She also said she wants to reach out to people in the community and give citizens a chance to have input about government. “Of course I’m a conservative Republican,” said Hank Huckaby, running for the open District 113 Georgia House seat. “I didn’t know there were any other kind.” Huckaby said when he was state budget director under former Governor Zell Miller he demonstrated his fiscal conservatism. Kirk Shook, the third Republican seeking the House slot, said he has helped conservative candidates get elected in the past. He said he got involved in the Republic Party “because I believe in certain principles” and he feels it is important “to have our values represented” in elected offices. More than 90 people attended the nearly two-hour event on Thursday, held at the Watkinsville Community Center on VFW drive. The GOP forum differed from the July 3 candidate forum sponsored by the Oconee County Chamber of Commerce and the citizen forum organized by Russ Page and me on June 10. The earlier forums included Republican and Democratic candidates, including Republicans running unopposed. The GOP forum included only the Republican candidates for the contested seats in the July 20 Republican primary. The first two forums were designed, at least implicitly, to help people make decisions about which ballot to ask for on July 20 and which candidates to support. Since there is no party registration in Georgia, voters can ask for the ballot of either party on primary election day. My analysis of individual voting records that I purchased from the Secretary of State’s office shows that 14 percent of those who voted in the July 2008 Republican primary had cast a Democratic ballot in the February presidential primary. The forum on Thursday night was designed for those who have already made up their mind to ask for the Republican ballot. Another question Giles posed to candidates for the BOE and to those seeking the House seat underscored the narrower focus of the GOP event. “Who are you supporting to be the next state school superintendent,” Giles asked BOE candidate Thomas. “Truthfully, I haven’t followed that race very much to this point,” Thomas said. He added that he had been busy with his own campaign. Governor Sonny Perdue announced the day before the forum that he would appoint Brad Bryant as State School Superintendent to fill the term of Superintendent Kathy Cox, who resigned to take another position. Bryant has said he will run for election in November as an independent. The Democratic and Republican parties will select the party nominees in the July 20 primary and, if necessary, the August runoff. “Who are you supporting for governor and why?” Giles asked the candidates for the House seat. Shook was asked to respond first, and he said lots of people had been asking him that and he had been telling them whom not to vote for, rather than whom he supported. He said he believed Jeff Chapman “would do a great job.” He suggested people take a look at him. “He has some great conservative principles,” Shook added. Huckaby was asked to respond next, and he said he had “mixed emotions about answering” since he believed “in the secrecy of the ballot. We all have a right to make our own decisions.” Despite that feelling, he named Nathan Deal and Eric Johnson as the two people he thought could lead the state best, but he said he would support the party nominee regardless of who it is. Neither party can control the candidates who file to run in a primary, but they can try to make sure any candidates who might deviate from party orthodoxy are exposed. The GOP forum on Thursday night was designed to do that. In addition, neither party is able to keep any legally registered voter from asking for a primary ballot. What the parties can do is work to make sure the party faithful turn out to vote in large numbers, thereby offsetting the effect of those who, in another state, might be registered for neither party or even for the other party. At the end of the Thursday night forum, Chairman Hanley asked for help with a planned voter drive designed to do just that. As of the end of the day on Friday, according to Pat Hayes, elections director for the county, only 198 people had voted in the first two weeks of early voting. Customers will have about two more weeks to purchase pine straw from the retail and wholesale operation at the intersection of Hog Moutain road and U.S. 441 after the Oconee County Code Enforcement office extended the deadline it had originally set to close down the operation. On April 6 Code Enforcement Director Steve Hansford sent Tyler McClure a letter saying he had until today to either file for proper zoning for the property on which he is operating or close. As of 5 p.m. today, according to Planning Director B.R. 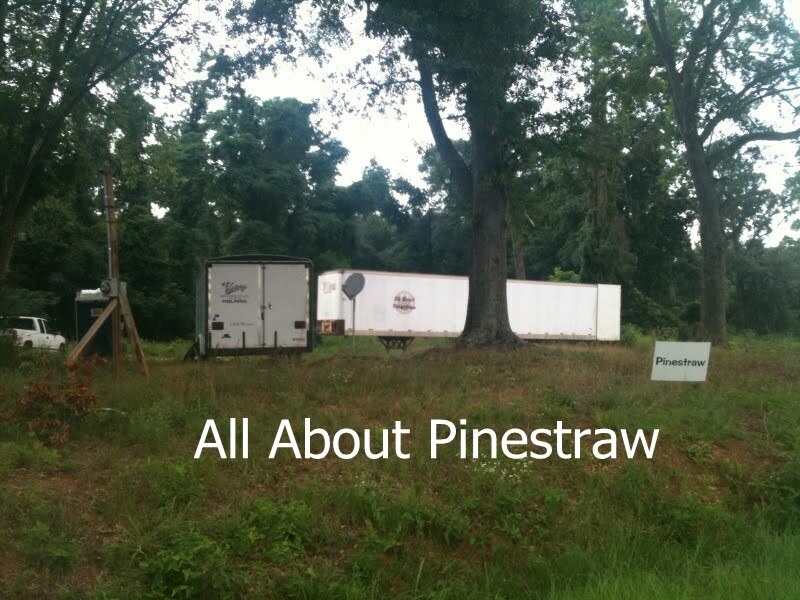 White, no one has filed a request to rezone the 1.7 acres on which McClure is selling pinestraw. Matt Brock from the Code Enforcement office told me this afternoon that Code Enforcement agreed to the extension because McClure has no place to move his business until the end of the month. Brock said his office did not want to put anyone out of work. He expects the operation to be moved by June 28, Brock said, though he does not know where it will go. In the letter Hansford sent to McClure on April 6, Hansford said that he had made a mistake when he issued McClure a business license on Dec. 23, 2009. The Planning Office and Code Enforcement are both located in the Courthouse Annex across the street from the courthouse. The front offices of the two departments face each other on the first floor of the building. 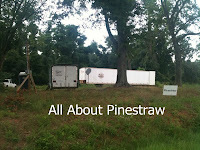 All About Pinestraw has operated from the site, which has entrances and exits from both U.S. 441 and Hog Mountain road, from trailers and vehicles. It has been serviced by a portable toilet. The Oconee Enterprise, under the headline “Pinestraw truck devoured by file,” reported in its May 13 edition that fire destroyed a truck on the site of the pine straw operation on May7. The story reported quite a bit of detail about the fire, based on comments attributed to McClure, and mentioned that a “small trailer” served as an office for the operation. The story never mentioned that the rather unconventional operation was on land zoned for agricultural and residential use, though I had reported on that fact on April 17. The Oconee County Board of Education, having invited Carter Strickland to apply for a vacancy on the board less than a month ago, passed him over tonight and decided instead to open up the process to other applicants. Board Chairman David Weeks tonight proposed the change in procedures for filling the Post 5 position vacated when Tom Breedlove resigned on May 10, saying that he had gotten a lot of feedback indicating that the board was interfering with the election. Strickland is running as a Democrat for Post 2 on the BOE and is unopposed in the July 20 primary. At the called meeting on May 19, Weeks proposed that the four qualified candidates for Post 2 and Post 3 be invited to apply rather than open up the position to everyone in the community. The other three board members accepted the proposal. That included Mack Guest, incumbent Post 2 commissioner and a Republican candidate for that position in the July 20 primary, and Kim Argo, incumbent Post 3 commissioner and a candidate for that position in the July 20 Republican primary. Argo and Guest subsequently declined to apply for the Post 5 vacancy, as did Mark Thomas, who has qualified to run against Guest in the Republican primary. Strickland alone said he would be willing to drop out of the race and accept the vacant slot. Argo has no one running against her in the primary and, unless someone qualifies to run as an independent, will have no opposition in November. Guest now has to get through the Republican primary and, if successful, in November get past Strickland and any independent who might qualify. Strickland has been critical of the board, indicating dissatisfaction with it motivated him to launch his candidacy. Weeks said that the procedures the board put into place last month were chosen because of “extenuating circumstances” resulting from the fact the election was underway. In other action, the Board approved a $53.5 million budget without discussion. The budget had not been released to the public at the time of the meeting, which began at 5 p.m. at the school central offices in Watkinsville. The board also agreed that the four members present would not accept the $1,800 each is entitled to as compensation for serving on the board this fiscal year. The new board member or members will have to decide on compensation separately. The board will accept applications for the Post 5 position from June 15 to July 15, interview applicants in early August, interview finalists in early September and make a decision in late September or early October, according to Weeks’ proposal, which was accepted unanimously. Weeks said the board wants candidates to be concerned about the entire system, not just parts, to be team players, to be unafraid of controversy, to understand that the superintendent actually runs the schools, not the board, and to be willing to stay in communication with the other board members. Guest, who was not able to attend the candidate forum last week, today sent me a copy of a statement he said he had asked board member Mike Hunter to read at the forum. When I asked citizens present at the end of the half-hour session for BOE candidates if they wanted to ask another question or hear Hunter’s summary of the statement, no one asked to hear the statement. In the statement Guest sent to me today, he said he was in Colorado at a business meeting with one of his largest clients at the time of the forum. Guest is the founder of LAD Logistics, which has warehouses, a logistics center and offices in Watkinsville. He said that “Despite what some would have you believe, we are clearly on the right track.” He cited upgrades to technology, infrastructure, classrooms and athletic facilities in the system as examples. The Oconee County Land Use and Transportation Planning Committee tonight decided to go forward with a plan to hold a public hearing in late July or early August on its recommendation that the county build a separate judicial facility near the courthouse. County Strategic and Long-Range Planning Director Wayne Provost showed the committee a first draft of a presentation that he proposed he give to citizens who turn out at the future public meeting. The committee took no note of the action of the Board of Commissioners, who on May 25 decided to move county offices now in the leased Courthouse Annex across the street from the current courthouse in downtown Watkinsville to the Government Annex on SR15 on the south side of the city. Commissioner John Daniell told me after that meeting that he wanted to see what kinds of renovations could be done to the Government Annex to accommodate administrative needs of the county before he made any decision about future space needs for either administrative or judicial activities of the county. Maybe all county administrative offices could be moved to the Government Annex location and the current courthouse could be dedicated to court functions, he said. The BOC decided to toss out the previously approved plans to redesign the space now used by the Public Works Department in the Government Annex and instead to redesign the entire facility to accommodate Code Enforcement and the Planning Department as well as other smaller departments now in the Courthouse Annex. The two buildings that make up the Courthouse Annex are referred to as the Dolvin property in deference to previous owners. County Administrative Officer Alan Theriault told the commissioners on May 25 that he expected construction at the Government Annex to start in January of 2011. At the Land Use and Transportation Planning Committee meeting tonight Provost offered a rough estimate of between $20 and 22 million as the cost of acquiring property for and building a judicial facility and renovating the existing courthouse for administrative offices. The Land Use and Transportation Planning Committee voted on March 9 to recommend to the BOC that the county build a separate judicial facility near the courthouse to accommodate the future needs of the county. Provost said tonight he thinks it is a good time to acquire property and suggested that the county might use some of the estimated $4.2 million in unspent Special Purpose Local Option Sales Tax revenue for that purpose. The BOC has decided to use an undetermined amount of that money for the renovation of the Government Annex. Provost said he would revise the presentation he gave tonight taking into consideration comments made by committee members. They asked that he include pictures, more details about possible funding and a time line for the construction of the judicial facility. The plan now is for Provost to bring that revision back to the committee at its July 13 meeting, which was nearly canceled. By a vote of 4 to 3, the committee turned down a motion that it not meet in July because of the difficulty of getting a quorum during the summer vacation period. The committee canceled its May meeting because it could not get the required eight of 14 members to agree to attend. At the July 13 meeting the committee is scheduled to decide the details of its public hearing. Committee chairman Abe Abouhamdan said he hoped that at least some of the commissioners would attend. Following the discussion of the courthouse, Bob Isaac, a member of the committee, said that he was concerned about the likelihood of traffic accidents at the QuikTrip gas station and convenience story set to open later this month at the intersection of Daniells Bridge road and the Oconee Connector. Abouhamdam said the intersection was under the control of the Georgia Department of Transportation, not the county, and the county couldn’t do much about it. Provost said improvements could be made when the Oconee Connector was widened, but he said that could be as late as 2020. Committee member Shane Carson said he thought the problem was going to be particularly bad about 5:30 in the evening when a driver decides “I need a drink on the way home” and turns suddenly into QuikTrip to pick up some beer or wine. The Board of Commissioners granted QuikTrip its alcohol license at its meeting on June 1. On July 1, it will cost $50 to get a plumbing permit for a residential property here in Oconee County. It costs $40 now, if you happen to want or need one. It will cost a resident of the county $90 per hour to rent the theater in the Civic Center on Hog Mountain road. Now it costs $80 for those who happen to need a theater. It will cost $175 to rent the Heritage Park Pavilion main arena for an event set-up. At present, those people determined to set up their event at the Heritage Park Pavilion can do so for free. It will cost $20 per person for a county swimming meet held under the auspices of the county. At present, there is no fee paid the county to be a part of such a swimming event. If, come July, you are careless and lose you membership card for the fitness program at Veterans Park, you’ll have to pay $5 for a replacement. You get a replacement free now. And if, starting on July 1, you want to purchase 2,000 gallons of water from the county because during the next 30 days you think you might want a drink, because you feel you’ll almost certainly need a shower, because you think your clothes are likely to need washing, or because your toilet already is calling out for a flush, you’ll pay $20.75. At present, you pay $16.50. County Finance Director Jeff Benko made no mention of the water fee increase when he discussed the Enterprise Fund budget, which is the budget for the Utility Department and which is in balance only because of the water rate increase and a parallel hefty increase in sewage fees. He also didn’t mention the $5 charge for the membership card replacement. That money will end up in the general fund budget. None of the commissioners mentioned the increase in water and sewer rates, which will affect the county’s 8,700 water customers and 1,200 sewage customers, when the matter came up for discussion. No citizen spoke about plumbing, park set-up fees, lost membership cards–or water and sewer fees--when given a chance as part of the public hearing. Because everyone was so quiet, the whole discussion and vote took only 4 minutes and 23 seconds. As Benko said, he was glad the budget process had come to an end.